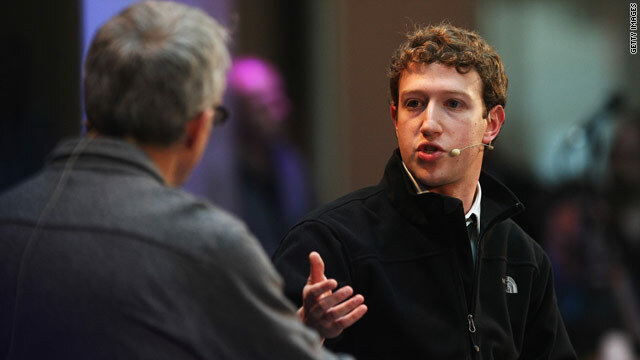 Facebook CEO Mark Zuckerberg announced the site's simplified privacy settings Wednesday. CEO Mark Zuckerberg has acknowledged making "a bunch of mistakes"
(CNN) -- Faced with a backlash that wouldn't go away, Facebook announced changes Wednesday that will make it easier for users to change privacy settings and block outside parties from seeing personal information. CEO Mark Zuckerberg said that feedback from users over recent privacy changes, which made some user information public by default, was crucial in the decision to tighten controls. "We think that they're the right thing to do," he said. "We listened to the feedback, and we agree with it." Facebook will begin rolling out the new privacy controls Wednesday, he said, and they should be in place for most users within the next few weeks. Zuckerberg said Facebook's new settings will give users "one simple tool" to control how their information is shared: with friends only, with friends of friends or with everyone. A single click also will let users block all of their information from being accessed by third parties, such as game or application developers. "All of the controls we had are still there if you want to use them," Zuckerberg said. "But we just wanted to make it easy for people who want to put themselves in one bucket very easily with just a couple of clicks." The announcement marks a rare double-back for Facebook, the nearly ubiquitous networking site that has made a habit of rolling out changes and then weathering user grumbling until it subsides. Among other changes, the site implemented a new tool last month that spreads user preferences and data across the Web. The tool allows Facebook users to more easily share articles and other Web pages they like but at the same time makes those picks easier for others to see. Some Facebook users also have been vocally opposed to changes that switched default settings for much of their information to "public." The Web information-sharing function requires users to sign up for it. And privacy settings can be reset. But the current setup of about 170 settings requires negotiating what The New York Times called "a bewildering tangle of options" to make the switch. Wednesday's announcement addressed what Zuckerberg had acknowledged have been missteps with the site's recent changes. Video: Privacy claims: True or false? "Maybe we should have gone a bit slower; maybe we should have communicated a bit more clearly," he said. "I'm not sure how we could have done that 100 percent better, but one of the things we've learned, time and time again, is that privacy is the most sensitive thing." He said Facebook wanted to make privacy changes quickly instead of drawing the process out. Zuckerberg said that as Facebook has grown from a dorm-room project he cooked up when he was a 19-year-old Harvard student, balancing public and private information has become an increasingly important and tricky business. Make too much info public and it jeopardizes privacy, but hide too much of it and it makes it hard for friends to find you on the site, he said. With more than 450 million users, Facebook has long outgrown its humble beginnings as a social site for tech-savvy college students. Some social media experts say that although tech-fluent users could switch their settings with relative ease, a huge chunk of Facebook's member base remains unaware of how to do so, exposing information they expect to be private. Under the new system, users will get a message at the top of their homepage alerting them to the changes and pointing them toward Facebook's privacy page, where they can tweak their settings. On the page, they'll be able to click one button to share all of their information with friends only, with friends and friends of friends, or with everyone. Users could also choose to make certain parts of their profile public while keeping other parts, such as photos, private. Every time they post something, users will still get to decide who gets to see it. And, under changes that Facebook had announced, applications that ask users for information will soon have to spell out exactly what information they plan to use. Wednesday's changes got an initial thumbs-up from at least some involved in online privacy issues. "While we'll need to see how the new privacy settings will work, it looks like Facebook is taking aggressive steps in the right direction," said Jeffrey Johnson, a New York attorney who specializes in intellectual property rights and technology. Johnson noted that the changes are more in line with privacy guidelines of the European Union, which has not shied away from imposing its standards on web operators like Google. "I don't think that's coincidental," Johnson said. Zuckerberg said that a handful of efforts to persuade people to quit Facebook over the privacy changes weren't a factor in the decision to roll out Wednesday's tweaks. He called the anti-Facebook campaigns "statistically insignificant," noting that Facebook has actually grown by millions of users since the privacy changes rolled out. Web analytics firm comScore estimates that the site has as many as 519 million users, which would be an increase of more than 100 million since last fall. Zuckerberg added that, statistically, the uproar over last year's creation of Facebook's news feed was bigger than this one. The site had fewer users then, and roughly 1 million were actively protesting the change, which remains a central, and widely accepted, feature. "When you have almost 500 million people using your service, if even a small percentage of them are upset, that can still be a larger number of people than the state of New York," Zuckerberg said.